Cyberpunk 2077’s gameplay demo has made a big splash at E3, but sadly the private showings so far have all been just that – private. We’ve heard plenty of reports about what’s been shown, but that game footage just isn’t out there yet. CD Projekt Red did, however, give out info regarding some the game’s characters, so let’s take a look at some of the people you’ll meet in the game. There’s Jackie Welles, a highly-skilled mercenary assassin who might be at home as an old west gunslinger. In the futuristic setting of Cyberpunk, though, he’s a small-timer looking to finally break into the big league. Dexter Deshawn is a fixer – someone who juggles illegal contracts ranging from burglaries and assassinations to kidnappings and human trafficking. Night City’s fixers are numerous, but Deshawn stands out with a wide range of contacts and mercs on call. Royce is the head of the Maelstrom, a street gang specializing in raids on corporate transports. He’s known as a “psycho,” but there’s some hint this is just a put-on to boost his rep – either way, he’s a cold one. Doctor Victor is a ripperdoc, a specialized technician with experience in both medicine and engineering. Victor’s had years of experience as a ringside doctor, and is well-suited to the mixed profession of healing wounds and repairing cybernetics. 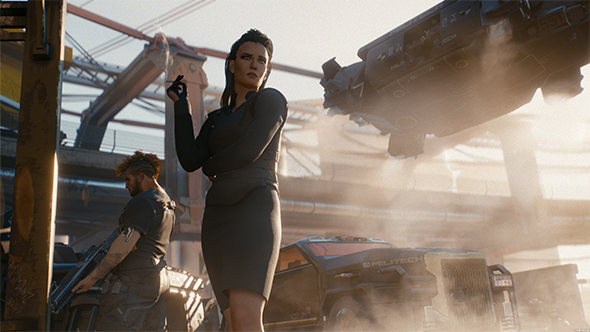 CD Projekt describes Night City’s corporate elite pretty much as you’d expect in a cyberpunk setting – a “new aristocracy” watching the town from high-end skyscrapers. Meredith Stout is one such egomaniac, and a highly successful one at that, regardless of her disdain for the city’s lower classes. We’ve already heard plenty about the central hero about the player character V, who’ll be highly customizable right down to their backstory – which, I’m sure, will have an affect on how these characters interact with you. Cyberpunk 2077’s release date can’t come soon enough, but we’ve likely still got plenty of wait left.